What Is the Difference Between Oranges & Tangerines? Many consumers believe an orange is just an orange. Citrus growers often cringe at this misconception, given the number of varieties available in this class of fruit. Oranges are at the top of the citrus chain, both in terms of eating and processing for juices. Tangerines, which are cousins of Chinese mandarin oranges, are similar in appearance but differ in many aspects. Learning the key differences between oranges and tangerines can help you better prepare your meals and snacks in accordance to your diet. 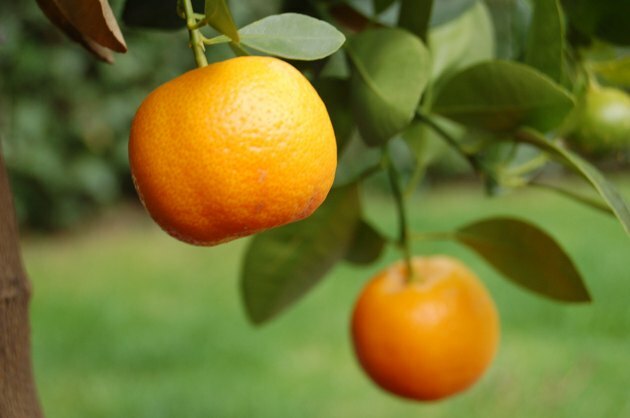 Oranges are second in size to grapefruit, while tangerines are smaller than oranges. Both have orange skins that are peeled before eating. Some types of oranges are called "navels" due to belly-buttonlike spots on the ends of them. Tangerines have slightly softer skins, which is why they are often mistaken for spoiled oranges. The advantage of the soft skins is that tangerines are easy to peel. In terms of taste, both oranges are tangerines are sweet, with the latter citrus fruit being less tart. The blood orange, meanwhile, is an extremely sour and tart fruit enclosed in a thicker skin than a regular orange. From a nutritional perspective, oranges and tangerines have more similarities than differences. According to Self Nutrition Data, 1 cup of each fruit contains about 100 calories, 1 gram of fat and 26 carbohydrates. Oranges, however, have significantly more vitamin C and fiber: According to the database, a 1-cup serving offers 8 grams of fiber, which is twice that of tangerines. The latter fruit provides 87 percent of your daily vitamin C requirement, while oranges offer 201 percent in the same serving size. Citrus fruits are considered a part of winter produce. In fact, the "Huffington Post" says tangerines are at their peak availability between October and April. While they're originally from China, tangerines are primarily grown in subtropical climates so the citrus can flourish during the warmer winter months found in such regions. Honey Tangerines are the most popular form, and they are grown in Florida. While oranges and tangerines are often imported from around the world, they can also last for weeks when kept in the refrigerator. The best way to eat oranges and tangerines is by hand. Simply roll back the peel with your fingernails and enjoy in sections. Both types of citrus fruits contain seeds, so make sure you don't eat these. You can also cut the fruit in sections and eat the juicy meat out of the peel directly. Tangerines make a sweet complement to fruit bowls without being overpowering in sourness. If you're looking to make homemade orange juice, choose exclusively from Valencia oranges. Their juiciness makes them impossible to eat by hand, which is why they are best reserved for your juicer or blender. How Many Calories Do Oranges Have? How Many Calories Are in a Clementine?